A nine-month clogger, Alyssa’s favorite song is Aretha Franklin’s “Respect”. Like mom, her favorite music genre is Christian Rock. 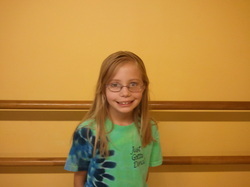 Alyssa says the best part of dance is all her friends and family in class. Alyssa is 5 ½ years old and comes to class with her mother, Jeanette, and sister Katrina. She also likes practicing at home with her family. When mom forgets to practice, Alyssa makes sure to remind her. Her smile lights up the room and she is a show stopper. Beth has been clogging for about 9 years and she was in tap for 7 years before that. 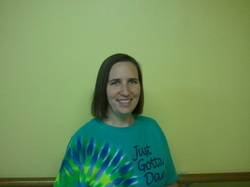 She enjoys clogging for the fun, exercise, the coordination and staying physically active. She also loves to perform with us in the community and says that she likes the challenge of more advanced routines. She likes all types of music but her favorites are 70’s pop rock, disco and comtemporary Christian. Betty has five children, three boys and two girls, and 17 grandkids. Betty says, I have always loved dancing, but it was always ball room. My mother and father went to dances while I was growing up so I suppose it is only natural that I would like to dance. All through school my classmates were always dancing. Today, when there are all school reunions, my class is the last to leave the dance. My favorite music is the 1950’s rock and roll and also country, so therefore I am more of a traditional clogger. Right now my favorites are Pretty Little Angel Eyes and Rocky Top, although I have several others that I really do enjoy. I became interested in clogging about 15 years ago when we had a big parade in our town. For some reason we decided to get together a group to clog at this parade and learned a couple of routines. Afterwards several of us tried to keep it going but it eventually faded. A couple of years ago I had the opportunity to start taking lessons, so I have been clogging since then and love every minute of it. I cannot imagine anyone not liking to dance, so the best advice I can give: Keep Dancing! Bonnie has been clogging for about 12 years. She enjoys all types of music as long as it’s lively and gets everyone’s toes tapping. The combination of steps determines her favorite routines. The best part of clogging for her has been the friendships, the challenge of the routines and exercise. Bonnie is always quick to volunteer to help the team in anyway she can. Jackie’s clogging career started about ten years ago. Her favorite routine/songs are Little White Church and Rocky Top. Asked about her favorite genre of music, she states “primarily Country, but likes some Pop”. 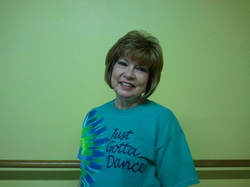 Jackie shares that she has always loved to dance and the best part is, dancing is exercise you don’t even think about. She is originally from Tennessee but has been in Oklahoma for fourteen years. Janice was born and raised in Tulsa. She is married and has one daughter and twin grandsons in GA. Only kids left at home are her dogs and a cat. She has always loved to watch dancing, in the movies and her friend Jeanette also on our team since she was a small girl. And when she came to Alyssa’s graduation the bug bit her and she decided to give it a try. She has been clogging for a year. 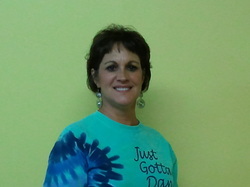 Janice’s favorite routines are Old Time Rock and Roll and Rockin’ Robin. She loves that she can have fun dancing and get some great exercise. Jeanette has been clogging since she was 11 years old, on and off. Her favorite routine would be anything with a good beat and a few (not too many) advanced steps to challenge her a little and really get her moving. Her favorite genre of music is Christian Rock. 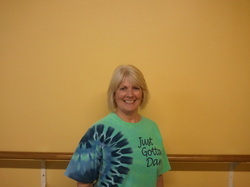 Jeanette likes having the ability to use the rhythm in a song to express it through this fun and energetic dance form. She’s happily married to a non-clogger and also blessed that, not only does he support her love of dance, but that both of their daughters (Katrina and Alyssa) have joined in the fun of clogging with her. Together with her Mother-in-law, Annette, and her Sister-in-law, Ashley, it has really developed into a “family hobby” over the years and she would encourage anyone who’s interested in learning that, even though it’s fun to clog on your own, it only gets better with a big group of loved ones by your side. Jerry has been clogging for approximately eight years. He lists Mozart’s Concerto #21 as his favorite song (hmmm) and classical, easy listening and 50’s Rock & Roll as his favorite genres of music. Jerry says the best part of clogging for him is the dancing, socializing and performing. Jerry is a great guy and we are all so glad he is a part of our team. Although I have wanted to be a dancer since I was about 10, I didn't know about clogging until after I retired and have now been clogging for 26 months. My two favorite routines are "Rum 'n' Coca Cola" and "Old Time Rock n Roll". This is consistent with my favorite music genre's: '20's flapper, and rock and roll. I love dancing in performance, especially when it includes the Charleston step. More personally, I am mom to a son and a retired school librarian, teacher, and have been an international volunteer. Katrina has been clogging for almost 4 years. Her favorite song to clog to is Lady Gaga's "Bad Romance". Her favorite genre of music is Pop. She finds that her favorite part of clogging is to just have fun! Katrina is 10 years old and is the daughter of Jeanette and big sis to Alyssa. The three of them enjoy practicing at home. She enjoys going to clogging workshops and thinks it's fun having parties with our team. 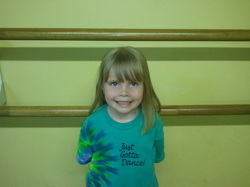 Katrina works very hard at learning new steps and is a wonderful performer! Paige has also been clogging for almost a year. Her favorite routines are Old time rock and roll and Hey soul sister. She likes some of the new ones but is still learning them. Paige’s favorite genre of music: pop rock, country. Asked what the best part of clogging is: “I love it all. Curtis is a great teacher. I like the dancing. I really enjoy the people and watching them dance”. Paige is single, has no children except for her dog, Peanut, a 4 year old Dachshund. Proudly states she will be 50 this summer.